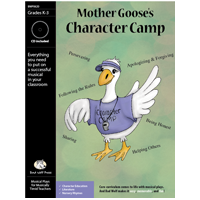 Written specifically for younger students, Mother Goose's Character Camp is the perfect simple introduction to character issues, including sharing, kindness, perseverence, honesty, apologizing and forgiving, and following rules. It's designed so that any scene/song can be omitted to make a shorter show. It's the last night of Mother Goose's Character Camp, and our Nursery Rhymers are eager to share what they've learned. Will Miss Muffet and the Spider be able to make amends after that whole curds-and-whey incident? Did Pussycat really go to London to visit the Queen, or was she covering up an afternoon snooze? And it's okay to bring farm animals to school if it makes the children laugh and play, right? Right? Maybe not. 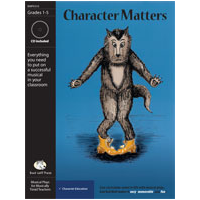 Find out from the Nursery Rhymers as they sing all about important character lessons. 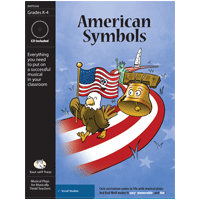 Filled with catchy songs and simple, humorous lines, Mother Goose's Character Camp is a great way to introduce character education to younger students and explore nursery rhymes in both language arts and social studies contexts. And, like all of our plays, this show can be used to improve reading, vocabulary, reading comprehension, performance and music skills, class camaraderie and teamwork, and numerous social skills (read about it!) -- all while enabling students to be part of a truly fun and creative experience they will never forget! Flexible casting from 8-40 students. All songs are sung by the entire cast. There are four Counselor parts and thirteen lines for Campers, but these roles can be changed and lines distributed any way you like. One student can play several roles if needed, and individual roles can be doubled up. Mother (or Father) Goose can be split into two parts or even played by the teacher. And all roles can be played by either boys or girls. This is the first third of the script. CAMP COUNSELOR #1 (wearing baseball cap, with a whistle around neck. Blows whistle, and CLASS comes to order): Okay, campers. Settle down. This is your last night at Mother Goose's Character Camp. Please give it up for Mother Goose! MOTHER GOOSE: Thank you, Nursery Rhymers. You've made me very proud this week, trying so hard to treat each other well. Let's give a round of applause to your amazing camp counselors! CAMP COUNSELOR #2: Thank you, Mother Goose. Our campers can't wait to share with you everything they've learned. CAMP COUNSELOR #3: So let's get started right away with Little Bo Peep. Hey, where's Little Bo Peep? CAMPER #1: Looking for her sheep. She lost them. COUNSELOR #3: Again? That's seven times! CAMPER #2: It's what she does. CAMP COUNSELOR #4 (looking at clipboard): Okay, let's go with, uhÉ Jack and Jill! What happened to them, and what did we learn? Come on, let's go, they need our help. And fix Jack's crown with Super Glue*. Step on up and do what you can do. Other people will be kind to you. Of Jack and Jill and their sad pail? Maybe they should use the sink! COUNSELOR #1: As we've seen at camp, there are many ways to show good character. COUNSELOR #2: One is working hard and trying your very best. COUNSELOR #3: Take Peter Piper. He didn't stop until he'd picked a whole peck of pickled peppers! CAMPER #3: What IS a peck? MOTHER GOOSE: Nobody knows, dear. The important thing is that he kept trying. COUNSELOR #4: Just like our Itsy Bitsy Spider. SPIDER: That's right! You think a little rain can stop these lightning-fast legs? (runs in place) Not a chance! When the raindrops washed him out. And he didn't quit or pout. Try my hardest every time is what I have to do. You're too little is what they said. Give up now, go back to bed. No! said the spider, no no no! I can do it and I'll show you so! Get the memo, it's time to stop. You're washed out and you're washed up. COUNSELOR #1 (looking at clipboard): Now let's hear from the Pussycat. COUNSELOR #2: I haven't seen Pussycat today. PUSSYCAT (standing up/entering): Here I am! COUNSELOR #3: Really? You've been in London? COUNSELOR #4: Did you get the Queen's autograph? PUSSYCAT: Well, no. I lied. I've been in the mess hall sleeping under a table. CLASS (shouts): Pussycat! You need to tell the truth! I have the Drama Club at Jefferson Craig Elementary School in Vevay, Indiana. I use students from grades 3-6. I have about 30 students who meet after school. I have done it for 20 years. I have used Bad News Press for many of them. I like the fact that all students are on stage at the same time, which avoids chaos backstage and allows parents/ audience to see their child on stage a lot. I tried the easier stories this year so our performance might appeal to our younger students. We will perform this at the end of February. I just used "Mother Goose's Character Camp" with 27 Preschool through 1st grade students for one of our school's Summer Camps. We only had class for three hours each afternoon for one week - and the script/songs were so easy to learn that they had it mastered for their final show on Friday! It was a HUGE success with rave reviews from both the students and the parents. Thanks for yet another great musical! A new favorite! Questions About "Musical Play: "Mother Goose's Character Camp""
Q: Will the digital download have an audio recording for the play, which has all the songs both WITH and WITHOUT vocals or is it just the songs? 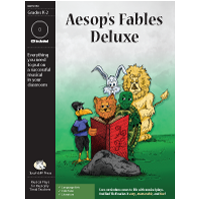 A: Yes, the digital download includes all tracks that are on the CD—the vocal versions first, then the instrumental versions. Log in to add an answer to this question.